As Christmas nears (dare I say it, I have done nothing to prepare yet!) 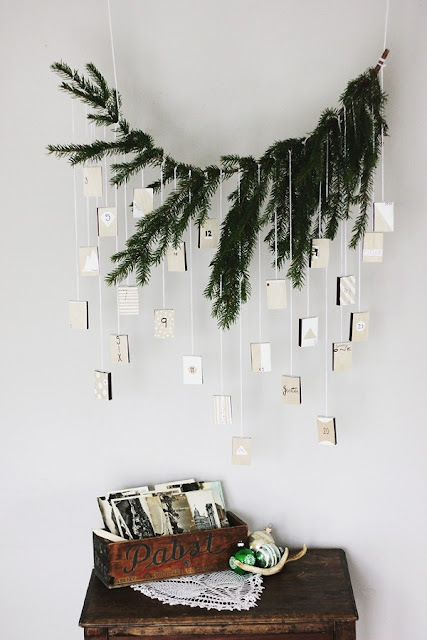 here is a lovely topic that can be used in a practical sense, perhaps table place settings, with a gift, maybe an advent calendar, or maybe for tree decorations, whatever you decide, the topic is very flexible - always handy when time is tight! This is our final Challenge of the year, there will be one more topic to round off the year, but no challenge with that one. 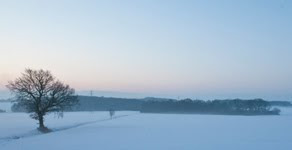 I urge you to go and take a look, Mac actually made several samples over the course of the challenge, and a few went into the linked post above, but there were plenty of other beautiful entries this fortnight too! Thanks for joining us, it's nice to see your take on the challenge! So, back to our topic of the next 2 weeks...boy did I find it hard to select ideas, there are so many ways to go with this topic! 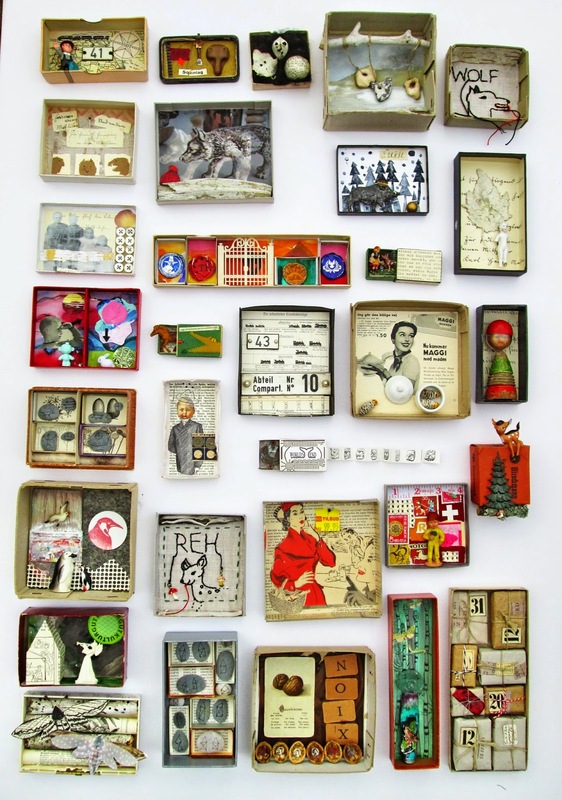 Just like people have collected 'things' forever: stamps, coins, cards, so it is with matchboxes. Initially created as a practical tool to light a fire or perhaps a cigarette, the outer covers soon became a suitable place for images, advertising or seasonal themes, and hence matchbox collections were born. However, on this occasion, we are more interested on using the box itself as a mini structure. We do like to go small when making art, so this can be great fun, and many see, quite manageable, to tackle a smaller project, than a massive one. 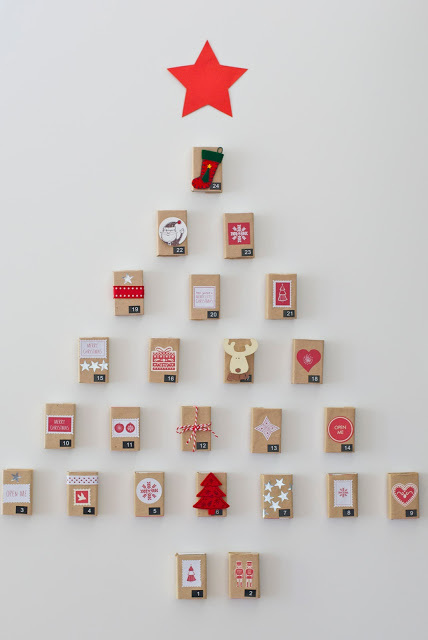 Here's a timely idea, an advent calendar blogged by Ally, that is super effective due to the restricted colour palette of kraft, red and white. 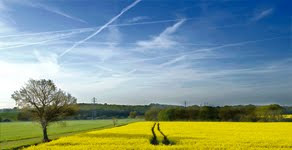 Check out the link below the picture for more details on its creation. 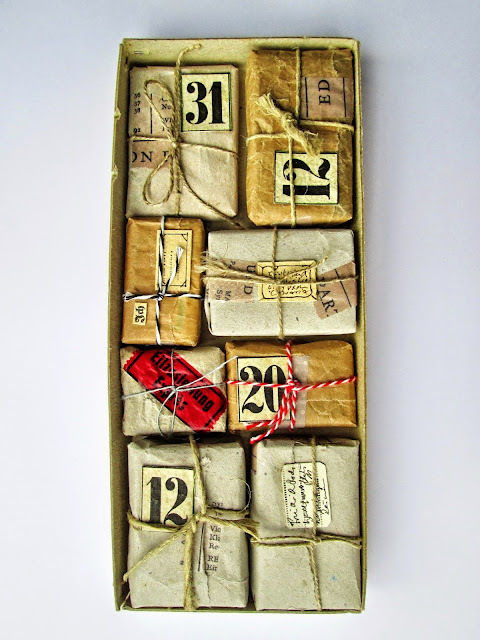 In fact, if that floats your boat, here is a link to a whole bunch of home-made Advent calendars. Within I discovered another matchbox style one hanging from a branch, and the matchboxes were covered with plywood. Again, the colour scheme brings cohesion and simplicity. In 2013, Manoswelt (Mano's World) embarked on an annual project to create 365 boxes. Many of them are teeny tiny, and the details are astonishing! Check out her blog. Here is a close up of the one lower right from the earlier picture. A bunch of boxes within a box. 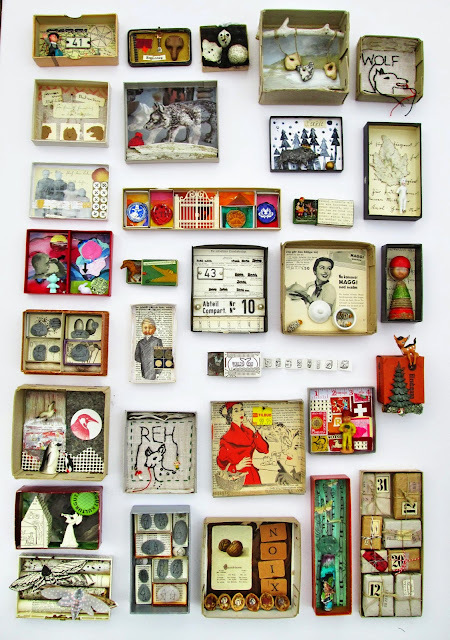 It is hard to comprehend the scale of her project, but I adore the idea of a few boxes wrapped up this way, whether a piece of art in itself, or actual gifts, it's cool!! 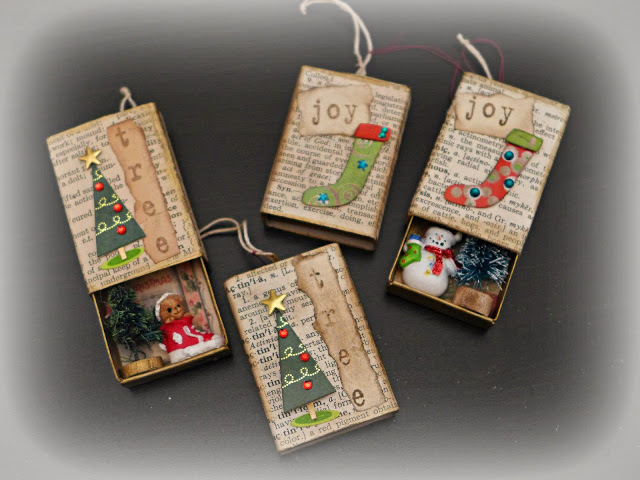 Still on the Christmas theme, Matchboxes as decorations is also going to add a personal touch to your tree. 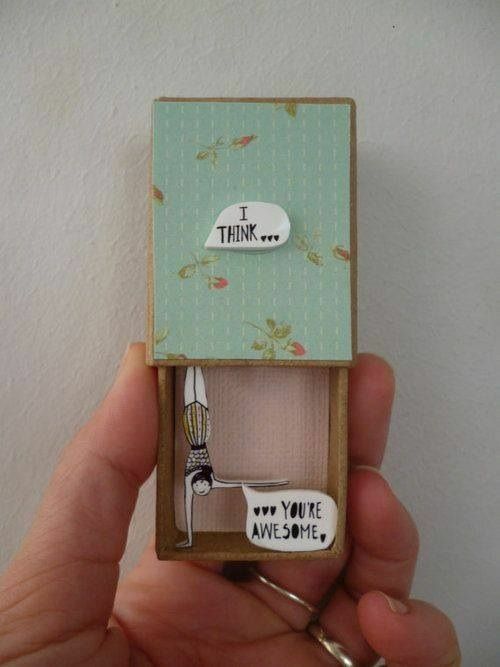 I'm sure you have plenty of images that would work to decorate boxes in this manner! Cute that both the cover and inside are being used to great effect! Here's a fun sample by Kate Crane with her Stampotique stamps. Similar in concept to the Darcy sample at the top of the page, it is fun to have legs that can 'grow' as you slowly open up a matchbox! 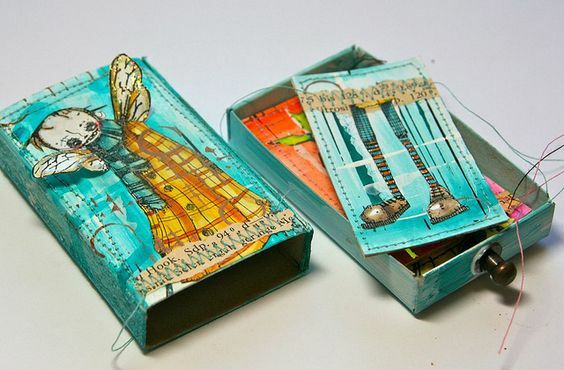 There is a fantastic tutorial here from Kay Williamson who has created the most stunning tiny matchbox library, the detail of each book is astonishing! 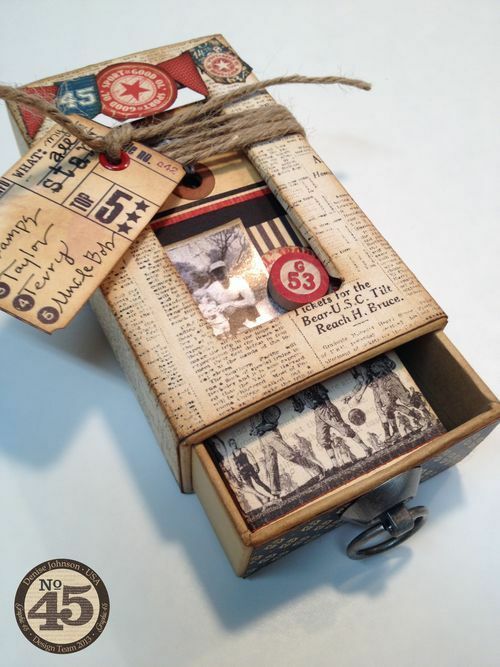 Here is a wearable matchbox by Gaby Bee, follow the link to see the reverse side, equally beautiful and therefore 2 wearable options in one composition! 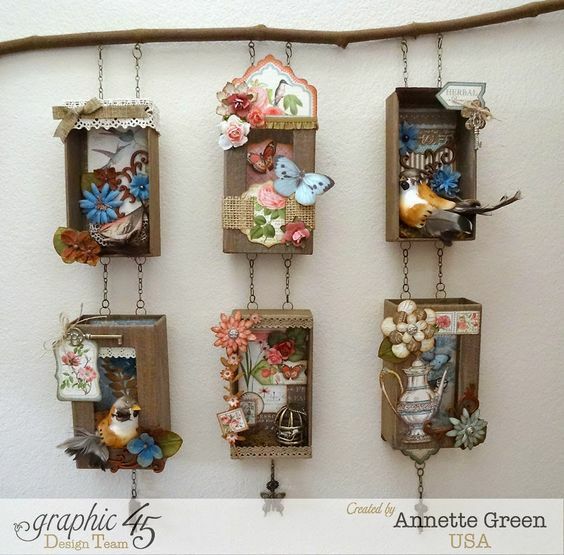 I really like this hanging idea by Annette Green, created for G45. So many little details, and if you follow the photo link there is also a video for you of how she made this. 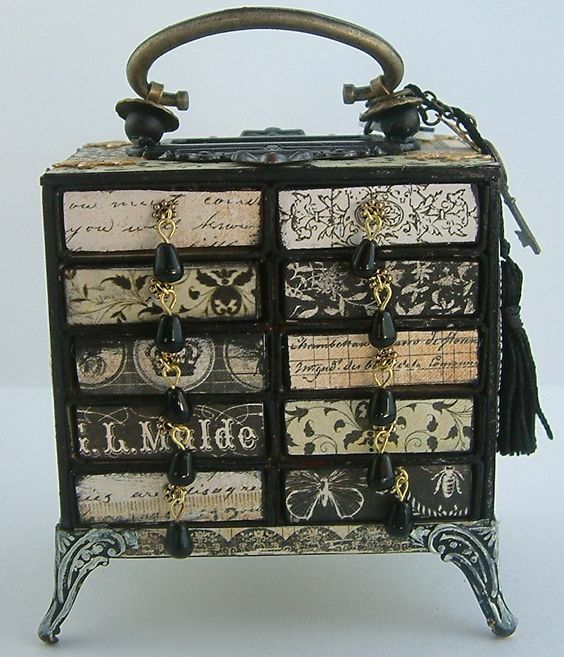 Laura Carson designed this chest from Matchboxes for Alpha Stamps. 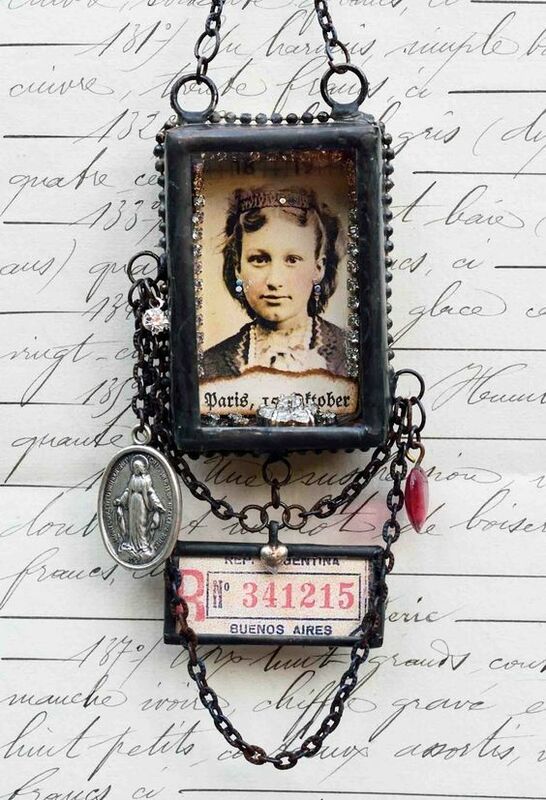 I'm sure you can spot some Tim Holtz hardware in the mix too. As you can see, Laura also made a detailed video series of 2 parts, and a downloadable PDF, so there is plenty of info here if a larger project like this tickles your fancy! So this blew my mind, and clearly it took the lady, Norma, who made it a long time to figure out too! See here for more. 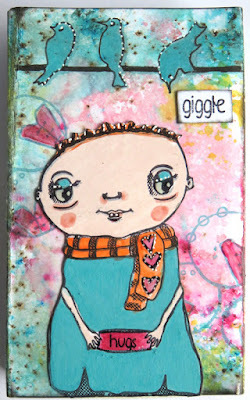 She did this project for a Magnolia blog hop, and it is fabulous! She also generously shares the template too. Think of the drawers as pie shaped sections, and you will get there! Isn't it fabulous!! There are plenty more construction projects on my Pinterest page for this topic too. Another great theme this fortnight and looking forward to all the posts and learning lots again. 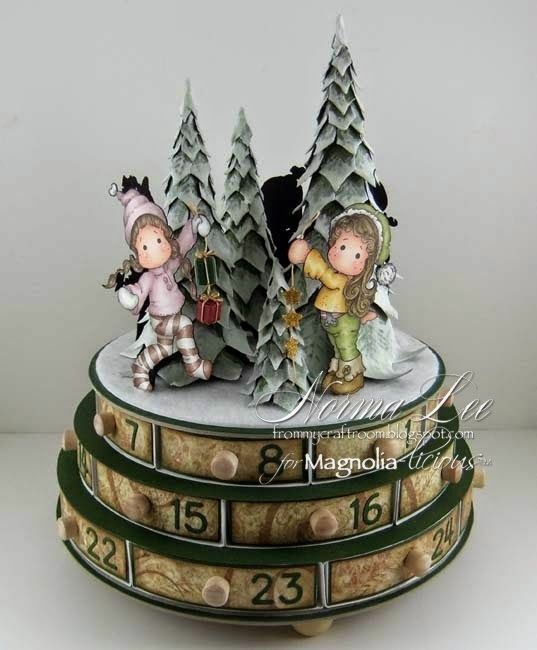 Love this Challenge just finding it hard to get through the Christmas pile up and play. This has made me clear my desk. Thanks for the prompts and inspiration.